Hey, for once I'm the first to comment :).I totally agree - it's a gimmick - for the parents. Schools couldn't afford one per student anyway. And well, why not teach the kids how to hold a pencil in the first place? The transition from this one to an ordinary pencil would just be another hurtle...later. I cannot comment on the Queen's English as my native tongue is Danish. But in Danish it probably would be "vrøvl". Looks like a great pencil for kids, I'm sure my son would love one, but have to agree with you on the name, it's absolutely atrocious! Dave, your review has saved me some pennies as I have picked this pencil up and put it down again countless times in my local officeworks store in Sydney - the price always seemed so high (about US10) and the lead refills were also quite pricey. The alternative Staedtler Noris Graphite 771 is a bit cheaper and probably just as good. Yep, I probably shouldn't have bought it. Blasted PAS, maybe I need a booster injection of the vaccine as my resistance seems to be a bit low these days. :>))). That's not just garden variety murder you're talking about, it's wholesale slaughter, it's a genocide! It's corporate-speak marketing mumbo-jumbo at its ugliest. I wonder what the legal department over at Staedtler makes of Stabilo's piracy of "ergo"? No one can protect "ergonomic", but "ergo" is stepping right up to the line. I think I need to protect myself from PAS because I've bought some terrible crap lately (some of which I've sent to you :>))), but I don't think the docs can prescribe me anything until I can tell them exactly what PAS is. I'm well acquainted with POS, but is PAS something like Piece of Attractive S_ite? PAS was coined by a commenter a little while ago. Pencil Acquisition Syndrome. But your version is good to, so PAS caused by a PAS, thats a nasty vicious cycle. Get to the medical centre ASAP. It only holds one peice of graphite at a time and has no storage? Plus you have to sharpen it? 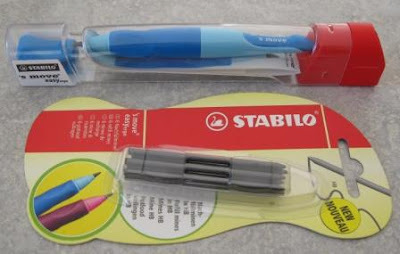 Anonymous,I understand yr mean.mybe Stabilo want the chridren by sharpener and 3.15mm pencil lead togerther.As uasaully,if the pencil leads larger than 2.0mm,they should put an sharpener together,or put in the push button. About the triangle rubber grip,I think it is comfrotable .but it is too big. but the color of the barrel was good and attractive,pink and blue.the chrildren love it. but no clip ,that is a problem. Anyway there was put on the market,hope it has a good selling. One thing I almost forgot: how can the children learn to rotate their pencil to keep it's point, when their grip is fixed? "Stabilo, hang your head in shame." 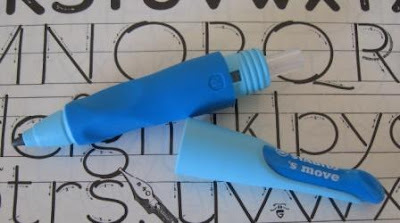 There seems to be trend - specialty writing implements from major manufacturers aimed at children. This example from Stabilo, the Pelikan Griffix, the Lamy ABC, Faber-Castell's Schulfüller and Tintenroller, and probably others. Or should I say - aimed at prosperous parents, as none of these items are cheap. I'm not sure if they are just a new marketing initiative, or an actual innovation in any sense. 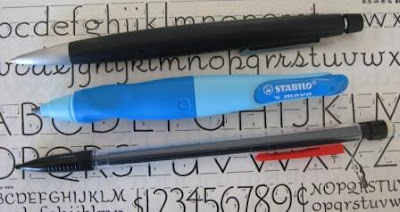 The Lyra Groove and Faber-Castell Jumbo Grip may be more cost effective ways of introducing handwriting while also addressing (in opposite ways) a child's challenge of gripping a pencil. "Stabilo, hang your head in shame." Made me laugh. The name of the pencil itself made me laugh. It's the most ridiculous thing I've heard! 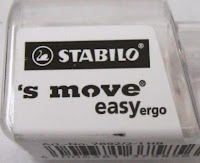 Maybe the webmaster of the Stabilo website himself hates the name and is torn between "easyergo" and "easy ergo". Either way, sounds terrible to me. Despite the name, this pencil has had me curious for a while. I saw one the other day, so I dropped my ~$20AUD for a blue, right-handed example and a six-pack of the appropriate graphite. I forced myself to use the thing for a day, at work. Despite the fairly terrible name and the slightly odd look, I rather like it. Granted, you do need to sharpen it pretty regularly, but it does lay down a nice line. I think the sharpener needs another look over in the design offices at Stabillo, mine has a tendency to produce a rather odd-shaped tip that isn't ideal. That said, it's not a fragile item, and it's stayed relatively clean despite my not-always pristine workbench and hands. Most impressive of all though, I picked up one of my fountain pens tonight just before I sat to write this. I actually noted an improvement in my grip on the rather hefty little FP, and my Pentel Kerry as well. For children learning the basics, I think this pencil, despite it's monstrous name might be onto something. Incidentally, my boss came to me asking about pencils the other day, after a solid but cheap 0.5mm pencil to teach his daughter how to properly regulate pressure when she writes. I can say that the young lady is now the owner of a purple Staedtler 777, which she loves, apparently! Mindstorm - What a coincidence - I purchased a purple Staedtler 777 yesterday. That completes my set Grey, Blue, Purple - I think that is the extent of the Australian models although NZ seems to have more. They are a nice pencil but not quite as good as a Pentel Sharplet-2. Searching on where to find this pencil online to buy, I came across your review. I will say, I love this pencil. 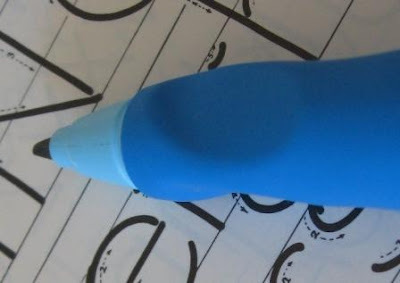 The first time I saw it, my son's Kindergarten teacher showed it to me, because I was trying to find pencil grips that wouldn't fall off normal pencils. My son's fine motor skill will more then likely never be up to the point of using a regular pencil without some form of grip due to his Autism. He hates to write for any length of time, due to it almost hurting him to hold regular pencils. I noticed an improvement on his writing when his teacher had bought enough of the pencils for each of her students (and she was doing this out of her own pocket). I am now on the look out for these pencils, as I wish to get a few myself, a couple for him to use at school, one for his Autism class, and one or two for him to use at home. I have noticed that the name of the pencil has been changed to EASYergo 3.15. Besides that, a 1.4mm variant will be available in February. Thanks for the update Gunther. 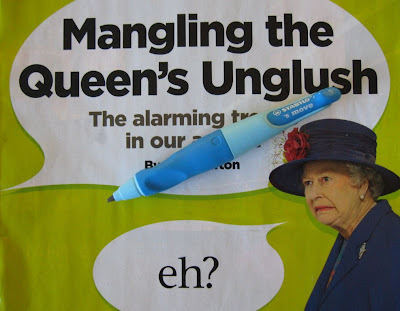 I feel sure that Her Majesty will now have a slightly less sour expression on her face. I'm also sure 1.4mm is a worthwhile alternative option, as noted in my review comments re 0.9 or 1.3mm. I don't get the name thing... "easyergo" was a blend of easy-ergo and easyer-go (probably spelled easier? ), right? But what was the 's? Maybe a reference to the German "Deppenapostroph"? 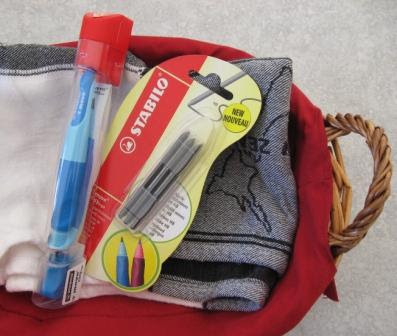 And they wanted to include Staedtlers "ergo" (Staedtler and Stabilo HQ are within a 10km range, approx.)? Thought that I'd way in on the discussion even though the initial review is a nearly a year old. Purchased mine (red+orange) a week ago. A definite PAS moment...my partner even told the shop assistants at the checkout that I had a 'stationary fetish' to explain why she had to shout at me across the shop to hurry up (maybe I fit the demographic after all). is what mine says too. AAaarrgghh (must be old stock, although it was available in the 4 colour combo's that the newly badged 'EASYergo 3.15' that Gunther linked to is). Been bugging me less every time I've read it although initially I was just puzzled...maybe I just didn't get it. Could it be that bad. Since reading your review you've reignited my annoyance (maybe I'll scratch it off). The other thing that annoyed me was the superfluous chunk of red plastic in the packaging...tried to work out if it had a function...couldn't get the sharpener in it...didn't contain any info or a handy block rubber/eraser. Useless (I think?). although negative so far I must now say that this pencil is ace and has found its way into my pocket as a permanent feature (I always have some kind of drawing/writing implement loose in my trouser pocket, usually 1, but sometimes I find 4 or 5 pens pencils...another story). For just writing (what the pencil was intended to aid) I would avoid, but as I am generally sketching or making visual notes and only annotating it's pretty damn good. The weight issue... It's really light (I was surprised too). In my opinion this is good as it allows for much more subtlety in mark making (free hand drawing)...this might sound like nonsense, but lets just call it a lighter touch or something (maybe I've just got puny arms!). The grip is perfect for me...how I was taught to hold a fountain pen all those years ago...defo' can't do any perpendicular to paper holding though. The pencil sharpener is useful,(although I may have mislaid it already). Pencil looks like it should/could have a lid/cap where there is a slight indent below the grip. Might aid the form and stop my pockets from turning grey when I forget to retract the lead...Although I'd most probably misplace it pretty quick. The complaint about no extra lead storage is understandable, but as it's 3.15mm where the hell would you put it. Another plus is although someone could remove the name sticker and pass it off as their own, no self respecting adult would be seen dead with it. So pencil theft is out. I admit that this pencil is totally nothing special and probably the best thing about it is that when (not if) I finally loose it, there won't be any tears (well not many). Just off to hunt down the 1.4mm. Thanks Kieran, good to hear from you. 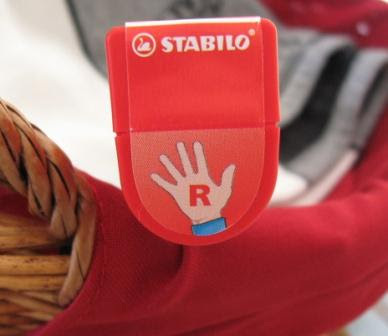 My daughter has one of these stabilos. 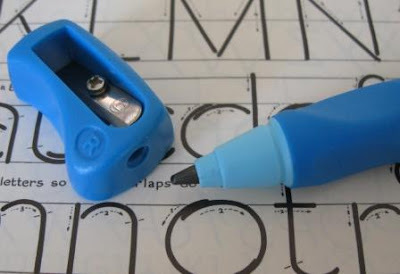 While she never sharpens it, it still is nice to write with. Sometimes the lead can break inside of the mechanism, and recently it blocked completely. I was unable to unscrew it, or to push the broken lead out with another lead. Now I got really furious and I hammered the open tube on the back side many times on a piece of carpet. No unblocking yet, but a lot of lead pieces came out. I pushed quite strongly on the tube, which got then unstuck. Some more hammering and more pieces appeared, then the mechanism accepted a new lead nicely and works as new! Hope this could help someone with the same problem. Agreed: a terrible name. Something like "Easy Click" would have worked. My son loves it but needed to be fixed by me and that was no easy task. It was blocked with lots of short pieces of lead. I had to press the white tabs in the threaded section,and after that the clear tube pulled off and all the stuck pieces fell out!